Rightwing Rumblings: Integral Education Part III Holistic development of Body,Mind & Soul. 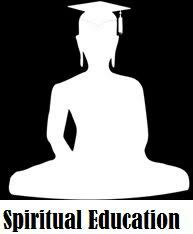 Integral Education Part III Holistic development of Body,Mind & Soul. Education system is now totally institutionalised. One of the major drawback of this corporatised system is that they merely transmit 'book' knowledge to mind. Word to word are embossed on the memory, no special training is given to the mind to observe the Ultimate Truth. In Bharat Varsh we do talk of imbibing 'values' into our education system. But manifestation of such 'values' are done by coercive way. We threaten the child that bad doing will result in bad "karmaphala" and God will punish you. We are forcing 'values' through fear and blackmail. Instead of training them to realise the fruits of ultimate truth of following 'values' , we bring in fear of punishment if not followed. Its new age , old unscientific ways will not work with the current Generation. We need to reinvent ourselves in bringing morals , spiritualism near to Science. The current Generation is intrepid, fearless of God , fearless of "Karmaphala". It believes in questioning and seeing is believing for them. That is the one reason why most of the Youth do not believe in Karmaphala or God. GenNext believes in Science rather than Spiritualism . Where does Science get such appeal ??? Its from Truth. The power of Science is verifiable Truth, which is the same all over Globe. Science is visible and thus gets more acceptance. It does not float on fear . Science is not on speculations. Youth acknowledges the benefits of Science has brought to the Humanity. Spiritual Education has to come close to the science. For that it has to forego the path of fear and head on truth. Unlike Science Spiritual Education has vast role to play in changing the life of Humans. Science restricts itself to Mind , where as Spiritual Education trains on Body, Mind & Soul . That is what we call an Holistic development. Science and Spiritual values should compliment each other in making student a better Human Being.